Pessimism is one of the great tragedies of life. Just take a moment and reflect on your life. Despite what the media will have you believe, we live in the safest time in human history. We live in a time where you can communicate instantly with people across the world. We live in a time where people can build audiences in the millions without going through the gatekeepers of the past. Why are we so negative? We are letting those in charge dictate what we believe. We tell children every day there is only one way to go through life. Graduate from high school, go to college, find a job, get married, work for forty years, and be grateful for what you have. If you don’t follow that exact formula, you are deemed a failure. What if you don’t want to follow that path? What if you want to create a path for yourself? When I was a child, I thought I knew exactly what I wanted to do. I was going to be a Disney animator. Then, in high school, I wanted to be an architect, and in college I wanted to work in the movies. I never pursued those dreams, but that is okay. Everything I have done has led me to where I am now. I have found my vision for the future. I want to be a difference maker. 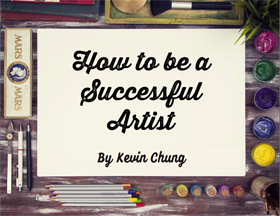 Instead of pursuing a career path for myself, I want to help other artists pursue a path of their own. I have gone from only thinking about myself to thinking about others. I believe the greatest path to success is by helping others achieve success. We only get one chance at life on Earth. Why let others dictate our lives for us? Discover your grand vision for life and pursue it without abandon because you can only achieve what you believe. When you are near the end of your life, do you want to look back in regret or do you want to look back and celebrate everything you’ve done?